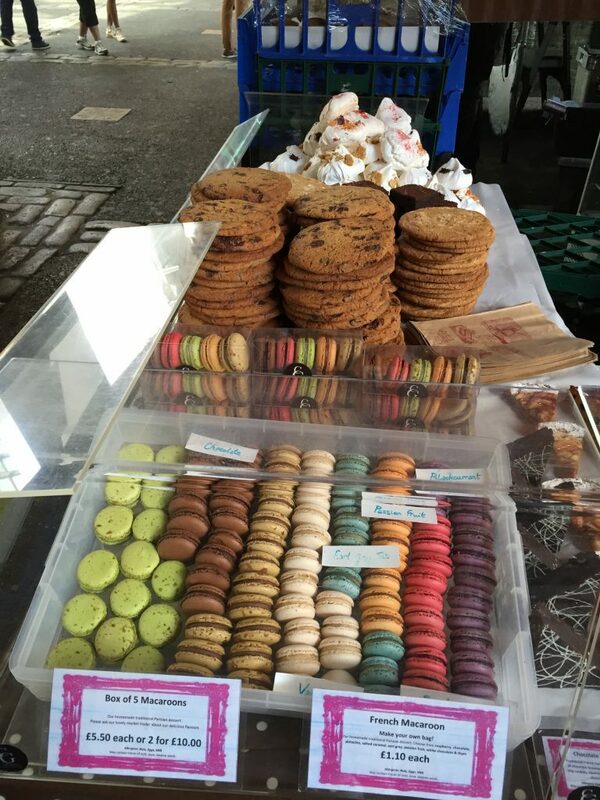 Borough Market was somewhere we wanted to go and was again on many foodie lists for must eats in London. Even reading on one blog a guy ate a feast for less than £20.00, I for one found this statement a tad hard to believe! So on our penultimate day in London for Mr Lees 30th we decided to test this claim. So multiple tubes (some advice for you, if you are heading on the central line, the red line then make sure you go naked. Ok maybe not quite naked, but it will feel like you are in a furnace if travelling on a remotely warm day). The nearest tube is London Bridge, and is just a 5 minute walk from there. We arrived at the market just after 10.00am (the scheduled time for it to open). My advice again would be leave it a couple of hours, as the food vendors arrive when they want and take forever to get going. With approximately 12 food vendors all fighting for your custom ranging from vegetarian wraps through to Indian and the great British Pie. 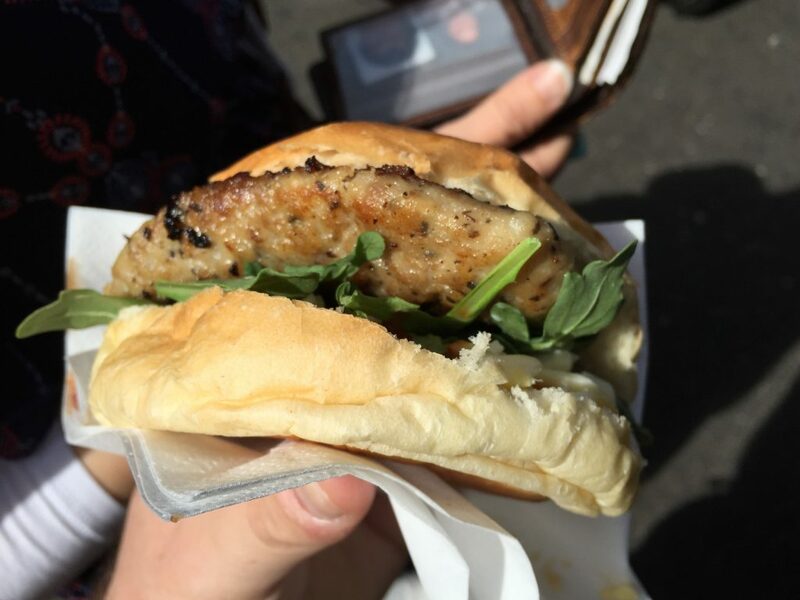 I (Lee) decided to go for a sausage burger (simply just the inners of a sausage bashed into the burger shape and cooked up). With that included some chilli jam, rocket and cheese (can’t remember now the type but it wasn’t you ordinary Cheddar). Oh boy was it worth the wait, yes it could have been devoured in 4 bites but you want to savour that taste again and again (I almost went for a second they were that good), mine was a single burger but you can double up for around £2.00. Tina’s took longer to be ready as she needed the the beef to get to temperature before any carving was done. It was then constructed in front of us like an artist begins to create a masterpiece from a blank canvas. Would you like cheese on that? He asked. Before I knew it we were watching this guy, light up a blowtorch (that’s right you heard me a blowtorch) and start to melt the cheese. We videoed him doing this and you can head over to our YouTube channel subscribe and get more great videos straight to your smartphone and tablet. 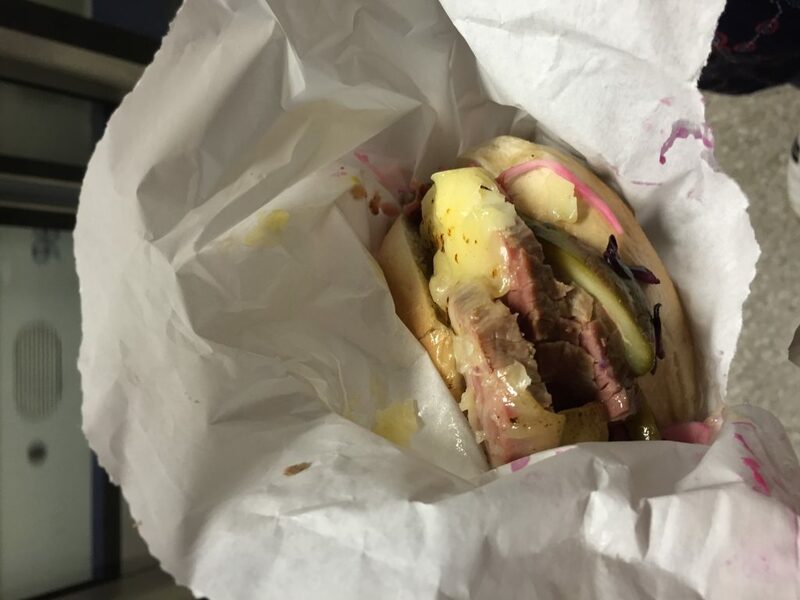 The Bagel was topped with what must have been 2.5’ of corned beef, gherkin (pickle if your American) red cabbage and lashings of cheese melted to a near molten temperature.